HomeSister E. Moore: Reunited Again! Sister E. Moore: Reunited Again! I was of course ecstatic when I knew I would see my sister again. But about a week and a half ago I received a phone call from President informing me that Elder Gong of the seventy had called about the meeting and said “is it true that you have twin sisters in your two missions?” President told him that was true and he said, “what would you think about them doing a musical number together to unify the missions?” And so President asked me what I thought of that and I was speechless. Playing for apostles with my sister??? So we quickly got to work because they had requested a specific song so we had to find a duet for that (which is another adventure in itself 😉). We found a violin and cello duet which we just transposed and found violins to use! Practicing was interesting…we tried skype practice but that didn’t work. 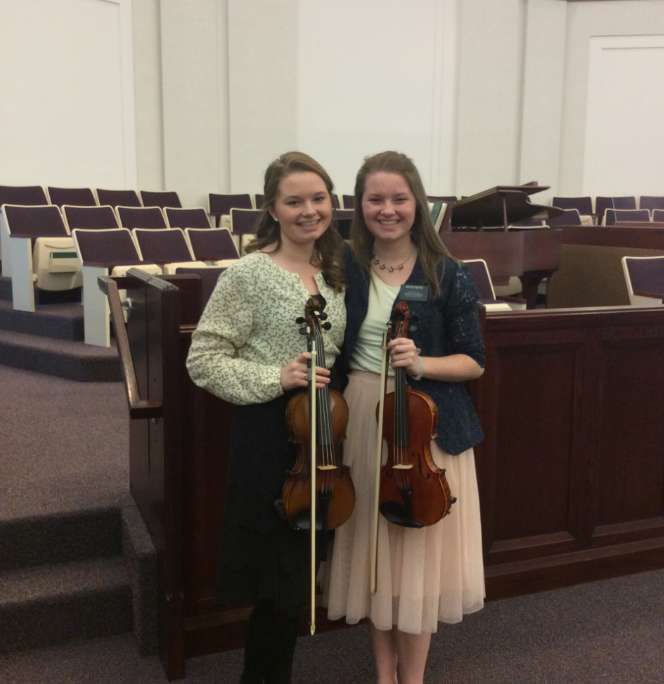 So last Monday my sister was able to come up to my mission to practice. And this Saturday we went down to Virginia very early in the morning to practice and play for apostles of the Lord. It went really well! (I’ll send you a video of our practice). Then after it was done Elder Ballard stood up, even though it wasn’t his turn to speak, and said, “that was so beautiful wasn’t it? I think they deserve to sit together for that!” And we both kind of looked around because everyone was squished in and there wasn’t room. Elder Ballard said, “I mean it!” And so they made room for us right in the middle of the front row in front of the pulpit. It was so amazing to be there with my sister for those couple hours! Oh wow I just can’t get over how amazing it was. They really are apostles of the Lord.